All around the world people have started planking—lying face-down, stiff, and expressionless across cheerleaders, their pet camels, and other weird and dangerous places, then posting pics of their stunts online. It's pretty fun, when nothing terrible and tragic happens. What could make planking not fun? One way is to get arrested for it, like how this one Australian guy who planked across a cop car did. He just wanted to be "the best planker there is," reports UPI. In general, cops seem to be anti-planking—maybe because people sometimes die from it. 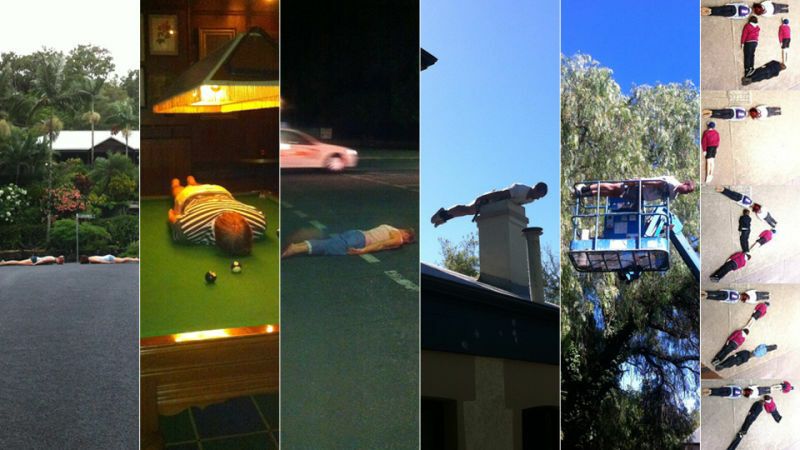 "As planking gains popularity, there may be more injuries and potentially further deaths," a Brisbane-area police officer warns. Yeah, probably. It usually works out okay, though! Just ask planking's Facebook friends, who already number in the tens of thousands. Many of them will celebrate their new favorite sport on Global Planking Day, which is happening on May 25. More details to come. Where you gonna plank on Planking Day? I'll probably be planking right here in my bed, underneath the covers. I call this activity "sleeping."